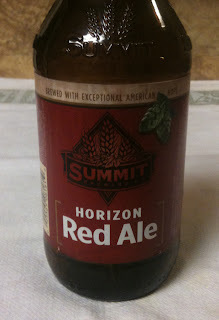 And now for a Horizon Red Ale from Summit Brewing Company. A twelve ounce bottle. Their web site lists 5.7% ABV and 60 IBUs. This poured with a small to medium head that was bone in color. The beer is a medium brown, with a bit of a red tint. Very clear - lets a fair amount of light through the glass. The aroma is hoppy, with hints of citrus and pine. This is not your typical red ale. There are some nice hops, and some malt as well. I would say strength is on the strong side of medium. A bit of sweetness, citrus and pine in the taste. The aftertaste has a nice bitterness. 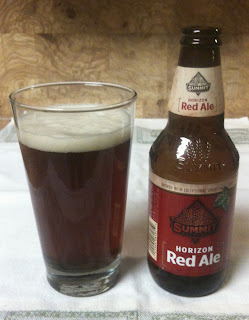 I am usually not a big fan of red ales, but this one has a lot going for it and is one that I would drink again.